Born to a working-class Sephardic-Yemenite family, mayoral candidate wants more money for education, less pricey photo ops. Moshe Lion, running for mayor in the October 22nd municipal election, says he wants to put the residents of Jerusalem first, rather then high profile international events. Leon spent the past five years as head of the Jerusalem Development Authority, a joint agency of the government and the municipality which apportions money to city projects. Lion was born to a traditional, working-class family in the coastal region of the country. His mother is from the Yemenite Jewish community and his father is from the Thessaloniki, the Sephardic community of Salonika, Greece. Trained as an accountant, Lion worked in the Prime Ministers Office and led Israel railways where he promoted the high speed line from Tel Aviv to Jerusalem. His is also a hazzan (cantor) who frequently performs the cantorial chants in both Sephardic and Ashkenazic styles in synagogues. He has been recently been serving as cantor for different synagogues each week in Jerusalem. 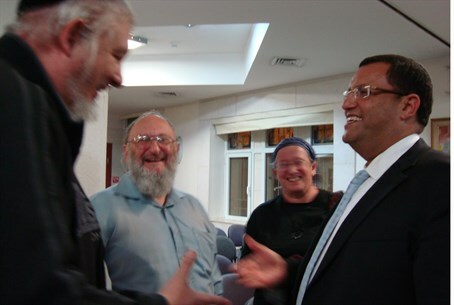 He addressed English speakers at the Orthodox Union Israel Center recently. For a podcast featuring excerpts from his speech, an interview with his English language campaign manager and excerpts of Lion leading Selichot services, click here. Lion stressed housing, education, transportation and cleanliness as major issues he wanted to deal with, saying prices in Jerusalem have grown far more then in other cities. The dramatic difference between the supply and demand is one reason for skyrocketing housing prices, he explained. "There are 2,000 units being built but the minimum we need 5,000 apartments a year." He also stressed the Tama 38 earthquake reinforcement program. "You can build two and a half floors extra floors for each building, but there has so far been only one project like this in Jerusalem," he lamented. "The municipality has to help encourage it." He also explained the 'Pinui Binui' urban renewal program to renovate Jerusalem's older structures. He blamed a complicated bureaucratic process on the slow rate of building. It can take two years for a project to get off the ground via planning committees and zoning approval. Simply put: "You cannot build quickly here," Lion claims; he said his background in public policy will help him talk to the relevant government authorities "in their own language." On education Lion said Jerusalem has a long way to go. "We are 144 out of 152," he said, explaining Jerusalem's ranking in terms of bagrut (matriculation) tests. When audience members at the speech postulated that the number was because of certain demographic groups in Israel that are bringing the total scores down, Lion objected. He said even eliminating Arabic-language schools and hareidi communities where secular education is sidelined in favor of full-time Torah learning, the test score are still far lower then in other cities. The real reason for the poor results, Lion said, was lack of school buildings and teachers. "We have to build more classes in the city," He said. "Until now, in the last 5 years there were about 220 classes built in Jerusalem and we need a minimum of 500. We can do it by bringing the budget from the education ministry." As for teachers, Lion charged that the municipality lets teachers go rather then offering them tenured positions. "We are talking about 2,000 temporary teachers. We send our kids to the school and after 9 months the municipality fires the teachers. When I am mayor, I will take all 2,000 teachers and tenure them. After this we can upgrade the level of education," he vowed. "There was 2 million shekels in the budget for education and it was cancelled," Lion charged. "We must bring it back." On transportation, Lion said it was unfair that many residents must take multiple buses to reach a destination. Since 2010, most of Jaffa Road, Jerusalem's longest and most central street, was shut down to buses and vehicular traffic to make way to the light rail. When it began operations in 2011, buses were re-routed to feed passengers onto the light rail rather then having the bus travel on to the central bus station or other destination. "You have to take more then bus and transfer the light rail," for many routes, Lion explained. On the issue of sanitation, Lion challenges the audience members stating that neighborhoods throughout the city are dirty regardless of the socio-economic status of the residents. "Except for Beit HaKerem. That's more green," Lion said with a smile. He and a team of volunteers have been visiting different neighborhoods to assess the situation since the campaign began. "We need about 300 more sanitation workers to clean the streets," Lion proposed. Lion then addressed one of the most frequent criticisms against his candidacy - the fact that he is not a native of Jerusalem. "It's true, I'm from Givatatim," Lion said, "but that means I know what clean is, and it's cleaner there." Lion charged that cities in the greater Tel Aviv area are less dirty, pay less taxes, have a larger education budget and have cheaper housing. Answering an audience member's question as to his current address, Lion said, "I live just a few buildings from here with my family and it's very nice." Israeli law stipulates that candidates for mayor must be residents of the city in which they are running for election. Lion's English language campaign manager spoke to Arutz Sheva to fill in some more questions. For the full podcast interview click here. He blasted the current administration for what he sees as a lack of priorities. Although Lion, as volunteer head of the Jerusalem Development Authority, worked together with Mayor Barat on many public events, the manager criticized them as too wasteful. "When you spend tens of millions on a one-second drive-by from a retired Italian race car driver that costs tens of millions of shekels, and then you say there is no money for education, then there's something wrong," the campaign manager charged, referring to the Formula One Peace Road Show that took place in June shutting down many of Jerusalem's streets. "An even more extreme example are the recent Maccabiah Games," he said of the July international event. "Yes, it was important to have it in the capital city, but it cost one and a half million shekels just on the opening ceremony torch, and that's from the municipal budget. Yet you take a budget that fights school dropouts and truancies in Jerusalem and take it down to almost zero. We must put the residents first." He continued, "every child receives 1/3 of the investment than that of a child in Tel Aviv. Jerusalem children cannot go to school in a Formula 1 race car. We need to take them out of the converted bomb shelters they're learning in and invest in our children's future." He also criticized the soon-to-be-completed Jerusalem HaPayis Arena located next to Teddy Stadium and the Malha Mall. The current administration's new concept was to attract huge events and thus create more jobs and revenue, but he is skeptical. "Before Nir Barkat took over the basketball stadium project, it cost a fraction of the price it now costs. The idea of building a bigger stadium was Nir Barkat's idea. His administration is putting that particular project into a far greater debt then it was when he found it. I welcome the stadium. Moshe Lion welcomes it, but we can't be millions of shekels into debt." The source also answered some of the many criticisms of Lion's allegedly "shady" political connections. Whereas Mayor Barat made his millions as an independent businessman with connections to the private sector, Lion, an accountant by trade, formerly worked with Prime Minister Benyamin Netanyahu in the 1990s and today is being endorsed by such politicians as Shas leader Aryeh Deri and Yisrael Beiteinu leader Avigdor Leiberman, both of whom had their share of investigations over the years. "Leiberman supported Barkat in the 2008 campaign and no one said anything about that, but now when he supports Lion, its suddenly problematic," he retorted. "At least half of the government is supporting Lion," he added. He further called into question Barkat's political leanings in light of his endorsement by the Labor and Meretz parties, who are running together for city council. "I don't know Mayor Barkat's personal ideology, but he gave the eastern Jerusalem portfolio to [Jerusalem city council member] Meir Margalit of Meretz who thinks we should give up everything over the Green Line to the Palestinian Authority." Mayor Barkat, who grew up near the border of eastern Jerusalem, has been adamant in public about opposing a division in the city similar to the 1948-1967 occupation by Jordan. However in 2011 he proposed a short-lived plan to "redistrict" certain outlying areas. His plan, which has panned by numerous Members of Knesset at the time, called for the Jerusalem municipality to relinquish small portions of Arab populated neighborhoods. The campaign manager also criticized Barkat for his short-lived stint as head of the Kadima party's Jerusalem chapter in 2006. Although heavily courted by what was then the Knesset's largest faction, Barkat said he left when Kadima began discussing the division of Jerusalem. Today, Mayor Barkat is running with the Jerusalem Will Succeed party which he founded, while Lion is running with the joint Likud - Yisrael Beiteinu ticket. Lion's list contains a diverse cross section of Sephardic Israelis, Jewish Ethiopians and immigrants from Russian speaking countries. One such figure of note is Dr. Avraham Neguisse, founder of the South Wing to Zion organization, which advocates on behalf of the Jewish-Ethiopian community. Dr. Negussie was born in a Jewish community in Gondar, Ethiopia, and came to Israel in 1985. Others on the list include Dudu Amsalem, Vladimir Shklahr, Elisha Peleg, Valentina Moldanovski, Hila Yedid Barzila, Avi Shalom and Madonna Jeno. Elections are held every five years and are scheduled for October 22nd. Voters can choose one ticket for mayor and one ticket for a party to represent the 30-member city council. Voting cards indicating polling stations have already been mailed out to residents. For more information visit www.bocharim.org.il or call 02 629-6666. Despite their differences and the tense campaign, Lion and Barkat worked smoothly together for the past five years on many projects. In September at the Birkat Kohanim (priestly blessing) ceremony at the Western Wall on Sukkot, the two stood side by side and shook hands. It seems that even political rivals love Israel's capital city and want it to grow and thrive, they just disagree on how to do it. Arutz Sheva - Israel National News does not endorse any specific candidate or party. This article is part of a series on the municipal elections. For an interview with Mayor Nir Barkat click here.